​How well does your local community know you? ​QC Find Now ​Connects ​Local Businesses with the ​Local Community they serve! How often when discovering a NEW local business do you find out they had already been around for several years? Or better yet, how often do you feel you lack the information you need as a consumer to feel comfortable about a new business you come across. We feel that locals simply do not have a reliable resource to let them discover what's helpful, current, relevant and local. Knowing this, we have created a solution! 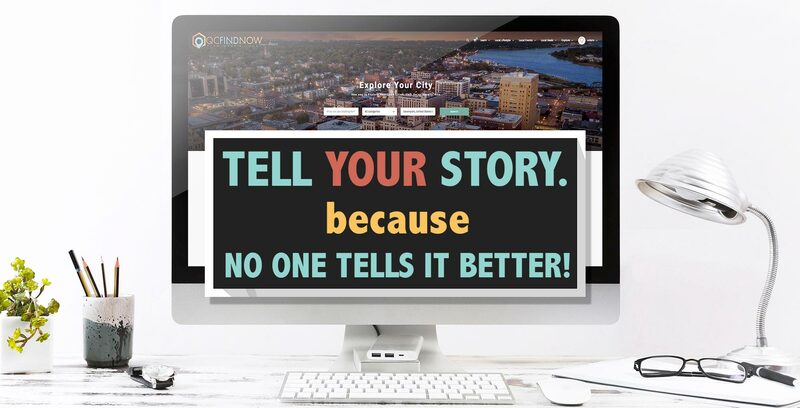 QC Find Now, LLC believes that today's marketing has NOTHING to do about selling but EVERYTHING to do with being able to tell your story simply yet effectively while being able to connect in a way to build relationships with the people you serve! Here at QCFindNow.com, we have created a platform where our local businesses have the tools and ability to be able to do just that! Simply, Effectively and Affordably! ​​Creating ​Your Online Presence to be Beautiful ​& Simple to Setup​! QC Find Now's number one objective is to be able to create a space where locals can find the local businesses they would otherwise miss out on. We also want to create online platforms that are inexpensive, simple, eye catching and user friendly. We take pride in what we are providing for our local community and we hope that you can see the value of what we are creating for our Quad Cities. 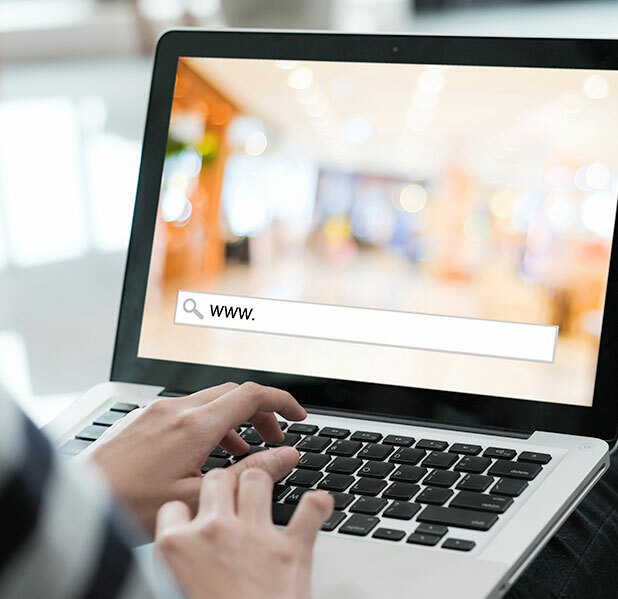 Our online business listings provide all the essential details of a business in an eye catching matter that spotlights their unique story of precisely what they do best in serving their local community. All while keeping ​the focus ​on being 100% local to the Quad Cities. The other important aspect of our services is that we make it affordable enough for any business to take advantage of! There are also additional services that we provide to cover the spectrum of your online marketing needs, including ones that are completely For FREE! "As a local business owner in the QCA, I am devoted to making this space the most cost-effective and simple way for businesses to get their products and services known locally without it having to cut into their profits and or time. Why? 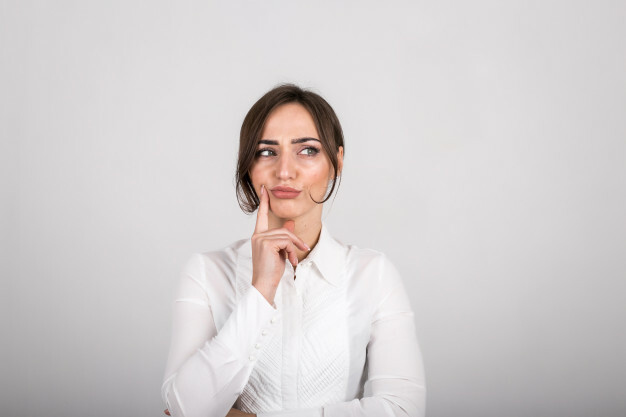 You might ask...because I understand the effort of what it takes to market a business properly...it's my skill set and something I know any business can do well with the right guidance and tools created with them in mind." QC Find Now, LLC has been designed with several functioning features that cover all areas regarding what a local would need to know about a business. Our listings give the community a lot to go on while choosing a local business to utilize, that fits their criteria the best. Our affordable and dynamic business listings include features such as the businesses’ Facebook feed, Facebook events, custom Instagram hashtag posts, the ability to add an extensive photo gallery, featured video, editable text areas, map with directions, contact forms, an endless creation of specific links and much more! Our website also provides additional access to designated pages where our local businesses can show off their recent deals and events in an organized, aesthetically pleasing manner, on a professionally polished, user-friendly platform. ​What we do & How it works! from the struggles of marketing your business. This gives you the opportunity to focus more valuable time on creating quality products and services. Elegant, simple, and easy to use, QC Find Now offers simple solutions that will help get your business known to your local audience without the headaches and extreme costs of other marketing efforts. Creating an account with QC Find Now as a business or as a local is easy to do. Once created, our social login feature allows you to login quickly. We have a system in place where locals can create accounts and have the capability of earning points by simply viewing local businesses on our site and more points by rating/commenting as long as they are logged in! Earning points is automatic. Rewarding locals to not only interact with our website but reward them for wanting to know more about your business. As a business, submitting a listing using QC Find Now is a breeze! You will have access to all of our listing and site features including our auto-complete mapping service, which will create a "map and directions" feature to your listing! You will also have the ability to upload your own photos and edit/add text as you please—all as simple as filling out an online form! Once you are set up with an account, you will have 24/7 access to update your listing information as often as you would like. As a bonus, and something no one else does, is that your social media feeds can be added to show up on your listing to automatically update as often as you post something new! Thus creating new content to your listing every time you post or add something to your feeds! 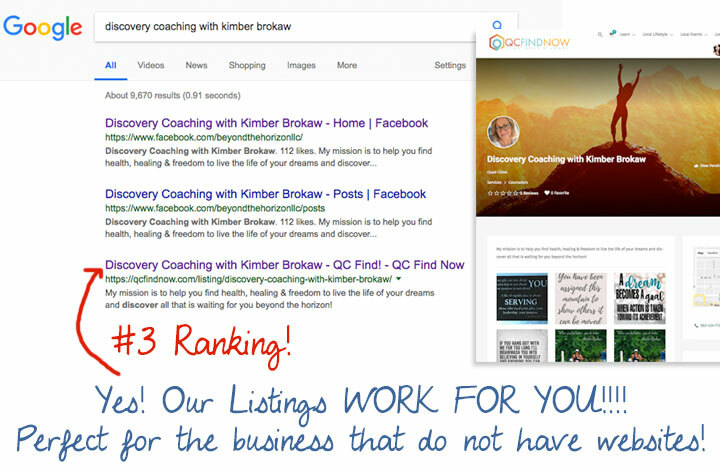 We know this probably isn’t the first time you’ve looked​ at a listing directory service, but hopefully it will be your last! With QC Find Now, you’ll have much more than you could need, want, or even have access to with most other directories. Let’s be honest, problems with some of the most highly functional listing directories is that they are not aesthetically pleasing or user friendly. They lack being exclusive to the Quad City community, they are expensive and pricey, and lack ability for you to access them, or are difficult and hard to setup... and lets face it are littered with ads! At QC Find Now, we have managed to address all of these issues and more! Combining our awesome photography, graphics, and fantastic functionality, all while keeping it local to the Quad Cities, what more could you ask for in a listing directory service?! Our listings are only the START of what we can provide as a way to promote your local business. In addition to our business listings, our website provides highly promoted local deals page, dedicated to showing off your current offers, and an events page, where you can display all of your upcoming local events. (With more features to come) Both of these are neatly organized and displayed with the local in mind. The features are easy to navigate by creating a user friendly environment to encourage locals to want to come back for more. Among that you will receive PRIME pricing and Discounts on our Add on Services of 30-50%, saving you hundreds if not thousands of dollars! Is your Online Marketing Actually WORKING FOR YOU? ​FUN FACT: Did you KNOW your listing ​WILL populate on GOOGLE?! Many of our ​businesses land on the first page of Google! ​***Please note Google ranking results will vary. 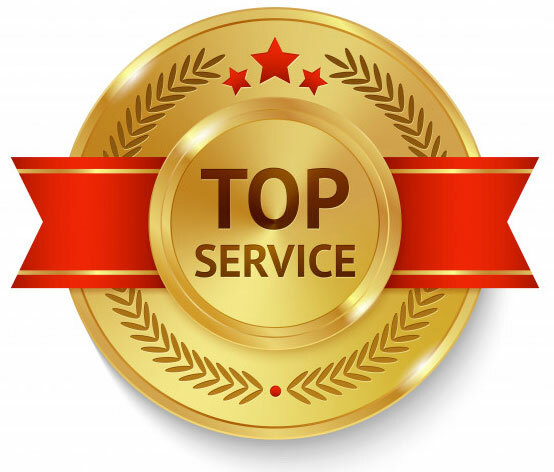 Although most all of our listers show up on the first page of Goggle we do not ​guarantee these results, as SEO is a specialized technical paid service. ​We have monthly or yearly ​payment plans, giving you options that best suits you. ​ ​Get ​Local Reach Now! ​Giving you the option to pay monthly! ​Stay ​A Lifetime with Unlimited Access Foever! We understand you are busy! ​Simply sign up today w​e will set up your listing for you for FREE! ​​​We make Setup a Breeze! We can be the replacement of your EXPENSIVE, outdated Website! ​You can plug in your social media feeds to show live! We can save you hundreds, - even thousands! ​It is ALL 100% LOCALLY OWNED and Quad City BASED! ​We have a team that works hard so YOU don't have to! What's the catch​? It requires YOU to ​take action! We have a NO FUSS cancel Guarantee​! ​No worries! ​ It's why we are here. We are happy to meet with you in person or speak to you on the phone or connect by email. ​Let's ​​design a ​strategic plan built specifically for you​r business online marketing needs! ​Something we know will ​guarantee to work ​when put into action! Simply fill out below and we will get back to you as quickly as possible. "WE THANK YOU for truly caring about our local community in help creating a space that allows them to discover what is local in a remarkable, modernized, user friendly matter! It shows how much you sincerely care for your customers and community!" What is the best ways to contact you? What is the best time of day to connect? Also add anything else you'd like for us to know. What is your current biggest marketing struggle? Let us also know your primary goal would be to achieve when working with us. Do you Currently have a website? If so what is it? Do you have social media platforms? If so what ones? What Services are you Most Interested in knowing more about?